To begin with: it doesn't make sense at all to cover Pink Floyd. So no band should want to do that seriously as the Floyd is unique in its own right and should stay that way. Making a tribute is of course a different story. 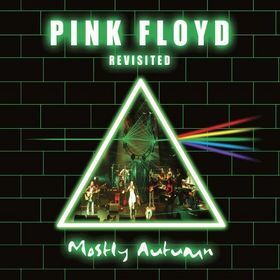 And Pink Floyd Revisited by Mostly Autumn is more than clearly a tribute. And fairly well done, actually. This cd was recorded when MA played a selection of Floyd songs in front of a rather small, but very enthusiastic crowd. Those present are awarded with good playing, some surprising songs (Julia's dream, Fat old sun) and some 'easy-to-predict' songs like 'Comfortably numb' and 'Another brick in the wall'. The music is played quite well with of course a very important role for Brain Josh' Floydish guitar. But also the keyboards are quite prominent in most songs, as is the bass playing by Andy Smith. Heather Findlay is more than great in a beautifyl version of Julia's dream, with Angela Goldthorpe on recorder and vocals. That really is a gem on this cd! But there is also a big negative thing to say about the performance and that is, again, the singing by Brian Josh. His vocals on, especially, 'Sheep', is false, too highpitched for his capacities and therefore very, very bad. It is only slighter better on 'Fat old sun' and 'Comfortably numb' and quite acceptable on the other songs. For some reasons Josh keeps to singing while he should concentrate on his great guitar playing and leave the singing to Findlay and, in some cases, Goldthorpe. On this cd his voals are really quite a mess and that is a pity when you try to salute one of the greatest bands that have ever played. Therefore not more than 2,5 stars.